So here it is at last -- Christmas Eve, or as we say in Norwegian "Julaften." It is a night for children everywhere to anticipate the fulfillment of wishes, and in the United States, all you have to do is leave cookies and a beverage (preferably one laced with strong spirits) for Santa Claus, and you are all set. For the Norwegian child, more hangs in the balance than just getting a Disney Princess and the Frog "Just One Kiss" Tiana Doll or not. 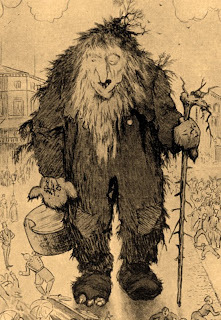 You must leave a bowl of groet, a rye/barley porridge, laced with butter, for the Christmas troll. If he comes to your house and finds no groet, he will kill all your father's cattle. That is one rugged Christmas tradition. I remember your little red troll figures. They were cuter than the figure above. "The Tomten," by Astrud Lindgren, was one of my all-time favorite books to read to my kids when they were little. I'm presuming there's a similar story in Norwegian culture. So cozy on a cold winter's night. Happy Holidays, Eugenie! It is a happy holiday, and I hope there is joy and love in your life.